The scope of inventory management concerns the balance between replenishment lead time, carrying costs of inventory, asset management, inventory forecasting, inventory valuation, inventory visibility, future inventory price forecasting, physical inventory, available physical space, quality management, replenishment, returns and defective goods, and demand forecasting. Balancing these competing requirements leads to optimal inventory levels, which is an ongoing process as the business needs shift and react to the wider environment - Wikipedia definition. Stock Position helps end-user and small organization to manage and follow his inventory. It is required at different locations within a facility or within many locations of a supply network to precede the regular and planned course of production and stock of materials. The software needs about 6MB on a disk drive. There are two modes to install and run the software. The Stock Position download package is available with a Setup program and a Portable mode called toGo in the table below. After few steps, Stock Position is ready to be use on your Windows session. The installer is built with Inno Setup software. Easy to use, you simply download the only package that includes the 32-bit and 64-bit files, and then you run this setup and let yourself be guided by the wizard. Uninstall is easy to do also. 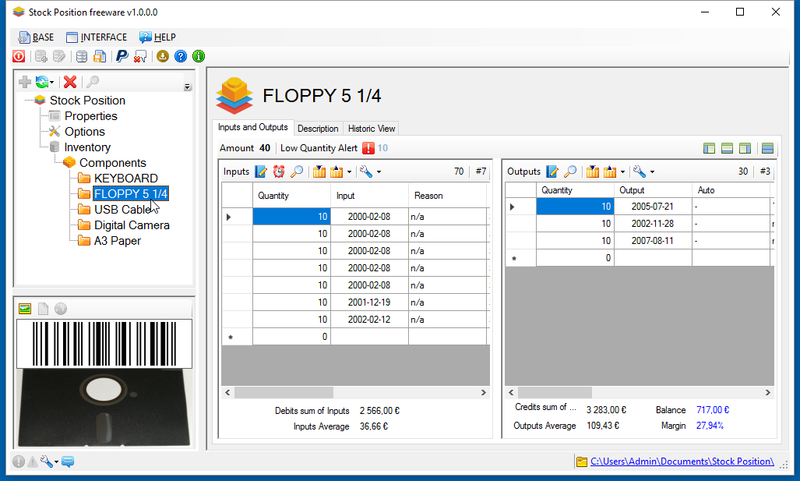 ToGo means Stock Position Portable is a standalone totally self-contained software. Both 32 and 64 bit auto extratng packages are compressed with Peazip program. Download the 32 or 64 bit package and from a mouse double click, execute the package to automaticaly uncompress it and generate a new Stock Position folder. If necessary copy or move it to your prefered folder or USB key drive. From the uncompressed Stock Position folder, execute the StockPosition.exe file to run it and use it.